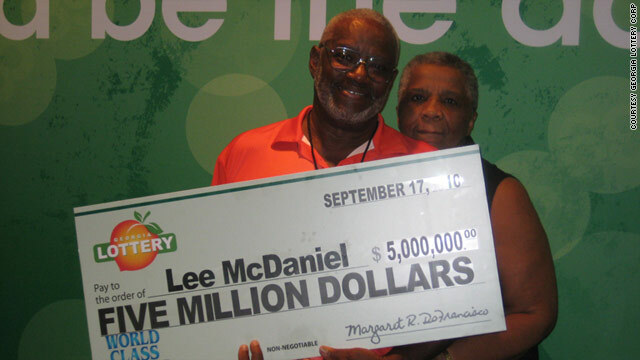 Lee McDaniel, 67, won $5 million in the Georgia Lottery last year. He says he has seen no downsides at all in winning. (CNN) -- She was a mother of three living in a small apartment and working four jobs. And then, as if in a fairy tale, she won her state's lottery last year. But the story doesn't have the happy ending you might expect. She didn't do anything overly extravagant after the $1.3 million got slashed in taxes. She bought a house, got a new wardrobe at the Salvation Army, cut work down to just one job and invested the rest. And then came the phone calls: promises, marriage proposals, accusations, threats. People who used to volunteer to help her do things wanted money for their trouble. Family members, she says, tried to run her life, and control her money. "Sometimes I wish I could change my name and go somewhere and hide," said the woman, who asked not to be identified to prevent further attention. It's fun to think about what you would do if you played lottery numbers that brought in millions of dollars. But, disillusioning as it may seem, big winnings can come with big costs, especially because of the greed of others, experts say. Jim McCullar of Washington state, who claimed half of the Mega Millions $380 million prize Thursday, said he was initially afraid to come forward because "all we saw were predators and we were afraid to do anything until we got down here with police protection." McCullar is "not going to know who to trust and whether he can even stay and live in the same hometown," said Steven Danish, professor of psychology and social and behavioral health at Virginia Commonwealth University. Lottery winners sometimes experience high-profile misfortune. West Virginia businessman Andrew "Jack" Whittaker Jr. is a well-known example; he won $112 million after taxes in 2002. Among his personal tragedies since then, his granddaughter and daughter have both died, and he has allegedly been robbed several times. Another case is Abraham Shakespeare of Florida, who was slain after winning a $31 million lottery prize. A friend was charged with murder in his death last year and has pleaded not guilty. Shakespeare, Whittaker and other unlucky winners have been featured in documentaries such as E! 's "Curse of the Lottery." Winning money in a lottery isn't always a "Lost"-style curse, of course. Lee McDaniel, 67, of Stone Mountain, Georgia, won $5 million in the Georgia Lottery last year. He says he has seen no downsides at all and doesn't have anyone in his life after his money. He remodeled his house, bought a large RV and a Jeep, and invested a good chunk of it at low risk. Aside from those material upgrades, one of the greatest parts of winning, in his view, was being able to help his sister in California, who needed a leg amputation. She would have had to live in a nursing home, but McDaniel gave her enough money to build a ramp in her own home. He and his wife also gave money to other relatives, just because they wanted to. "I don't feel that I have changed. I am just very secure financially," he said. Research in psychology and economics has found that people do get happier as their income increases, but only up to a certain level where they are comfortable. One of the more recent studies on the subject, published in the Proceedings of the National Academy of Sciences last year, found life satisfaction rises with higher incomes up to a household income of about $75,000, and levels off afterward. In general, the research on the happiness of lottery winners is mixed. A 2006 study in the Journal of Health Economics of lottery winners in Britain who won up to $200,000 found an improvement in their mental well-being two years later. But an often-referenced study from 1978, comparing 22 major lottery winners with people who did not win, found no difference in happiness levels between the two groups. There's not an extensive amount of study in this area, but experts have a few ideas about how to make that initial thrill of winning last longer and increase overall satisfaction. You've probably fancifully imagined what you might do with lottery earnings, but those who do well have serious plans for where they want to be in five years. Lottery winnings can help them get there, said Danish, the psychology professor. Those who don't have clear life goals are more likely to feel overwhelmed and fumble with the money, even more than before winning, he said. It's a common experience that giving away money makes people feel good, and science backs that up. A 2008 study in Science found that people were happier spending $20 on others than they were on themselves. In general, research supports the idea that people feel good when they feel they are making an impact with their money in a personal way and a sense of shame when they are stingy. Indeed, most iReporters said they would use $380 million to help the world, if they won that kind of money in the lottery. But if someone asks you for help paying a bill, that's a different story. If a friend owes you money, and you see him or her go have a nice dinner, you feel offended, said Michael Norton, associate professor of business administration at Harvard Business School, who co-authored the Science study. "When you become the rich person, who other people look to, it can actually erode the social bond that you have with people, because it changes your relationship from friendship into almost like a transaction," Norton said. It's a personal decision, of course, but research supports spending money on experiences rather than material possessions. Not only do going places and seeing things lead to more happiness, but experience-oriented people are better liked by others than those who are materialistic, a 2010 study found. And that's partly because once we buy something, we get used to having it around, and it no longer gives us the pleasure it did in the first few days following a purchase. An experience, on the other hand, can be enjoyed again and again when you remember it and tell others about it. Likewise, if you suddenly get a lot of money and spend it all at once, you might not get as much happiness as you would if you spread it out over time. If you slowly change your lifestyle so that you keep appreciating that new money, you'll most likely be happier than if you quickly make large adjustments at once, Norton said. For example, you could make a point to take a big trip once a year, rather than putting it all into a house. And that might be why Harvard economist Guido Imbens found that lottery winners who received annual payouts averaging $20,000 (in 1986 dollars) were happier on average -- the recipients got to have the excitement of getting more money each year, rather than adjusting to one lump sum. It's not clear that winning money changes personality, and it's impossible to know how people's lives would have gone otherwise had they not won, Norton said. The woman who used to work four jobs said she doesn't feel that she's changed -- but a lot of people around her have. She's grateful for what she has but feels scared to lose it. "I don't know whether 'happy' is the word," she said. "I'm still trying to grasp it."